Learn more about the history of these two neighborhoods of Madrid with an expert guide in gastronomy and history. 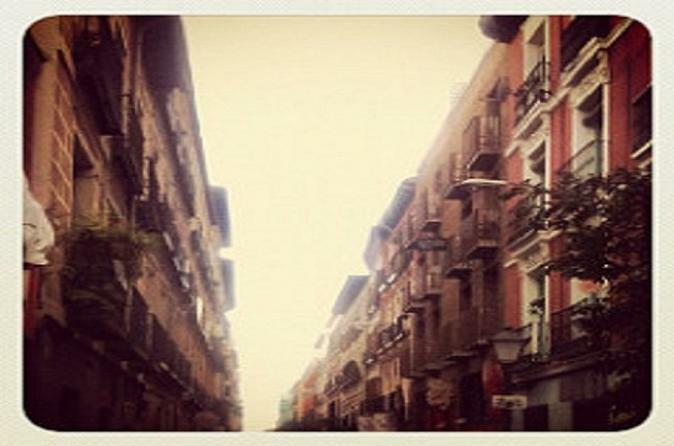 Our stroll starts at 12.30h or 7.00pm (depending on the tour option selected) at the exit of the chueca metro. Enter one of the most "Castizos" neighborhoods of Madrid with the help of an expert guide in gastronomy and history, with him you will visit three of the most classic bars of these neighboorhood. Our first stop will be in a tavern that today celebrates more than 100 years, founded in 1917 was originally a winery that would later become the current tavern. In this tavern we will try its specialty the Tinned Fish & Seafood like the mussels, marinade tuna, anchovies, razor-shells etc and its most representative drink, the vermouth. Our next stop is another tavern that was also founded in the beginning as a winery in the 19th century, later it would become one of the most emblematic taverns in the area, here we will try its specialty the Spanish omelette this has won many contests being one of the best Spanish omelette in Madrid. Our last stop is another classic from the area opened in 1929 as a liquor store, where we will taste its classics like vermouth and its more characteristic tapas such as tuna pie or bravas (Spicy fried potatoes).